Given that the Seaside Balloon Festival is presently underway here in sunny New Smyrna Beach, Florida, I thought a balloon-focused patent would be fun. Although I did enjoy taking an early morning boat ride to view the group launch last year from the water, until last night, I’d not attended a balloon festival in person. 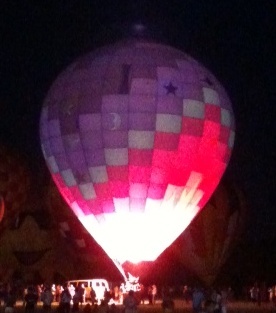 But, the evening balloon glow is quite stunning. What does this have to do with the Patent of the Day, you may be wondering? Well, I found a patent that was issued about ten years ago for a System and Method for Controlled Illumination of Hot Air Balloons. U.S. Patent no. 6,367,696, issued to Thomas S. Robins, describes a device that enables presentation of a choreographed balloon illumination display! Given the beautiful show that I witnessed last evening, with the balloons randomly lighting, I imagine that a choreographed event would be quite astounding. I hope that if any readers are aware of any such events, making use of this technology of this Patent of the Day, that information will be shared. 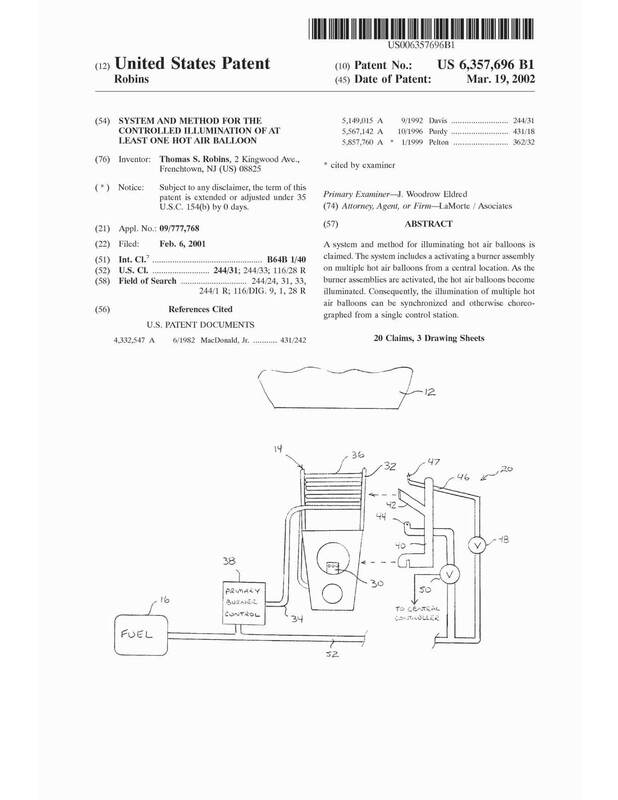 If you’d like to read more about the hot air balloon illumation system, click over to http://www.innovativeip.us/ofinterest.html where you can read the entire patent. And, if you’d like to still get in on the Seaside Balloon Festival, it is continuing all weekend, and the details can be found at www.seasideballoonfest.com. Enjoy!